"Arm Yourself to Prevent (and Fight) the FLU and Common Cold With These 8 Potent Natural Remedies!" Stay healthy all year long, even while others are getting sick! Each year, between October and March, millions of people all around the world fall victim to the seasonal flu and common cold. Well, Flu Season is upon us and what will that mean for you? Will you be another statistic or be part of the "healthy minority" that can continue to enjoy life in spite of the viral and bacterial bugs floating around? Whether or not you decide to vaccinate is up to you but you should also realize that you can actually fortify your body's defenses without the use of drugs and man-made chemical concoctions! I know you're serious about your health, otherwise you wouldn't be reading this, right? And that's why I know you're also serious about learning how to take care of your body naturally. Time and time again, those who fair best during flu season are those who are already healthy. They have fortified their immune systems and are ready for the challenges that lay ahead. Their immune systems are not strong enough. When was the last time you got sick, had a cough, a fever, "felt under the weather", or missed a day of work? For most people, the answer to this question will be eye-opening to the say the very least. According to the National Institute of Allergies and Infectious Disease (NIAID), each year, 20-25% of Americans get sick with the flu (influenza) or flu-associated illnesses - that's roughly 35 to 50 million people in the United States alone! Now could most these individuals have done something to prevent this? Most definitely YES! And that's what I'm going to show you how to do today. My motivation is simple - I don't want you to be part of the 25% of people who are getting sick each year because they are not healthy enough to begin with! I want you to enjoy great health so that you can go about your life without being held back by the latest "bug" or "pandemic". You can prevent the flu and common cold but it's starts inside. As you know, your immune system is responsible for fending off "foreign invaders" and "unidentified flying bugs" or UFBs (as I like to call them). Essentially, your immune system is like a country's military or defense system. If you think back to the "Dark Ages", a weak military (or defense system) was almost an invitation for invading Barbarian tribes to take over an entire population. Well nowadays, the barbarians are the viruses and bacteria that everyone is so afraid of. The key to not to being "invaded" is to have a strong defense system. Thus, YOU must have a strong immune system to stay healthy amidst the craziness! Bear with me for a second as I'm about to get a little scientific here. But don't worry I'm going to make it as easy (and painless) to understand as possible...just let me throw on my lab coat. When bacteria and viruses, also known as antigens, are detected in the body, your white blood cells (immune cells) work together to recognize and respond to the threat. These cells then prompt the B lymphocytes to produce antibodies, specialized proteins, which lock onto specific foreign agents and identify them for another group of immune cells known as T lymphocytes. Once an antibody is developed, it exists within the body for the rest of your life and provides protection against the specific germ it was created for, should the germ reappear. While antibodies recognize viruses and have the ability to lock onto them, they cannot kill them. That is what T lymphocytes do. Once the T lymphocytes locate the foreign agent, they destroy it. During the process, T lymphocytes also send out messages to other cells, most notably complements, that it is time for them to assist in the destruction of the invading bacteria and viruses as well. Your immune system is truly the most intricate defense system ever developed. It's fascinating! Recognizing how your body's immune response system is effective in fighting flu should encourage you to take an active role in fortifiying it even further. After all, even the best armies lose soldiers and can be weakened. Are You Depleting Your Army? Depressing your immune system is obviously not the objective you want, but it is helpful to understand how your dietary and lifestyle choices can have a dramatic impact on weakening your defenses - thus making your more susceptible to the flu and other illnesses! Consuming Sugar and Refined Carbohydrates - studies have shown that just 1 tbsp of sugar can depress your immune system for up to 6 hours! General Poor Nutrition - a lack of nutrients will not allow your immune system to function properly because the building blocks necessary for creating immune cells are absent. Malabsorption and Poor Digestion - these are caused by digestive system problems (ie. leaky gut, low stomach acid, candidiasis, etc...) and poor digestion, specifically, can lead to large unwanted food particles seaping into the bloodsteam, which prompts the immune system to activate to destroy - this is how most food allergies develop. The first issue, malabsorption means that essential nutrients won't be absorbed, and thus immune cells will be missing several key building blocks. Drugs - drugs like antibiotics, steroid drugs, etc... can negatively impact your digestive system (leading to the problems just mentioned), while others can directly depress the function of your immune system. Toxic or Improper Liver Function - the liver is your body's most detoxification organ. If it is toxic (and thus not functioning properly) it won't be able to detoxify your properly, leading to greater reabsorption of toxins, which will further depress your immune system. Since your liver also plays a massive role in the metabolism and production of fats, sugars, and proteins, these vital nutrients will also be affected! These are just a few ways in which everyday people are weakening their immune systems. But I know you're not one of them, right? Even if you are, I'm about to show a simple solution to build your immune system and your health so that you can stay healthy - all year round! So we've outlined the problems that come with having a weak immune system and we've looked at how you can depress your immune defenses (not that you'd want to) through simple dietary and lifestyle decisions you make each day. But now I want to turn your attention to the endless possibilities that exist when you provide your body with the nutrients and building blocks that it so desperately needs to create that "armour-like" immune defence. Specifically, I'm referring to 8 natural wonders that will keep your heathier than a mule. These are 8 nutrients that have been part of my regime for the past few years and I've incorporated with them thousands of my personal clients as well. Everything you need to know to prevent (and treat) the flu and common cold is now available to you. I've done the research. I've done the testing. And the results are irrefutable. Add these 8 immune boosters to your daily regime and I guarantee incredible health! Inside this brand new health report, you'll discover how these 8 natural remedies have the potential to augment your body's natural ability to provide antibodies, antiviral agents, and antioxidants during flu season (and beyond). The most natural remedies from the vitamin, mineral, and herb categories for fighting flu. Perhaps the most powerful vitamin for preventing and fighting the flu. A special mineral which increases the production of white blood cells. Nature's natural antibiotic, which you MUST have in your pantry at all times. A less well-known, "under the radar" immune boosting berry that works in much the same way as B lymphocytes. Because it's flu season, wouldn't you agree that you need any possible edge you can get to stay healthy? The reality is that sometimes, in addition to a healthy diet, your body needs some reinforcements to help deal with the onslaught of super bugs. 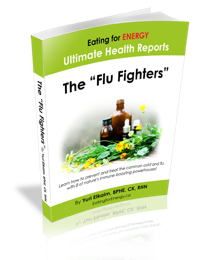 The Flu Fighter report will give you 8 of those immune boosting reinforcements. And don't worry, these are natural foods and remedies that you can grab at your local produce market or health food store. So are you ready for your healthiest flu season ever? If you've got kids, you OWE it them to learn this information so they can stay healthy in spite of all the germs that kids pass around to one another. This is vital health information for the whole family! I understand the timing of this report couldn't be more appropriate so that's important why it's important to pick up your copy before it's too late. The Flu is Going To Be With Us For a Long Time Yet - Don't Let it Get You (Again?)! Enjoy This Brand New "Ultimate Health Report" For The Next 60 Days With A No-Risk, 100% Money Back Guarantee! "Test drive" this Flu Fighter report for the next 60 days with absolutely no risk so you can see for yourself how much better you can look and feel with little to no effort. You are completely protected by our iron clad 100% money back guarantee on all of our Flu Fighter "Ultimate Health Reports". You will not only be satisfied, I guarantee you will be thrilled and amazed with this Flu Fighter report, or you can simply email me and ask for a prompt and courteous, no hassles, no questions asked, 100% refund. In fact, if you're not completely happy for any reason at all, then I insist that you ask for a refund. However, I'm totally confident that you're going to love what you're going to learn, discover, and apply after reading this groundbreaking health report! Let's make this flu season the healthiest and most enjoyable yet. Don't let others tell you that getting sick is normal or to be expected - it's not. At least not if you're taking care of your body with the right nutrients. And you'll discover how to do ALL of that (and more) with my brand new "Flu Fighters" Ultimate Health Report. P.S. The 43-page Flu Fighter report will tell you exactly how to use the 8 natural immune boosting remedies so that you can prevent (and fight) the common cold and flu. Following the guidelines I've laid out for you, in conjunction with a healthy diet, will ensure that you (and your family) stay healthy ALL year-round. P.P.S. If you've been sick in the past, the reality is that you'll most likely get sick again. That's a pretty consistent trend that I've noticed having worked with more than 47,000 clients around the world. But you can put an end to that vicious cycle by applying the immune boosting principles I lay out for you in The Flu Fighters. If you don't, how can you expect to change? How can you expect to get and stay healthy? NOTE: This is a downloable PDF e-report. Nothing will be shipped to you; instead, you'll be able to instantly download this report upon purchase so you can enjoy immediate benefits!